Gosh it's been a while since I visited this blog! I have really enjoyed blogging here and sharing my views, joys and inspirations. It's been a great platform for developing my style in both photography and blogging and has driven me to explore new music, art, style and hype about it! Many thanks for reading over the years. Can't believe I created my first post 6th July 2010! Feels like such a long time ago. And for people to still read this blog is amazing. Thank you for 89,965 page views! You certainly have given me the confidence. So time for a goodbye to this blog... it's been great blogging! The blog will still be live on the internet but I will cease to blog anymore. Yikes its been ages since I've posted on this blog! Almost a year. Well one of my summer resolutions was to blog more so today I'm deciding to put that into action! I must admit I've been demotivated by posting onto this blog due to the adult content I've been forced to have (this isn't an 'adult' site) but I hope you wonderful readers won't be put off by it! 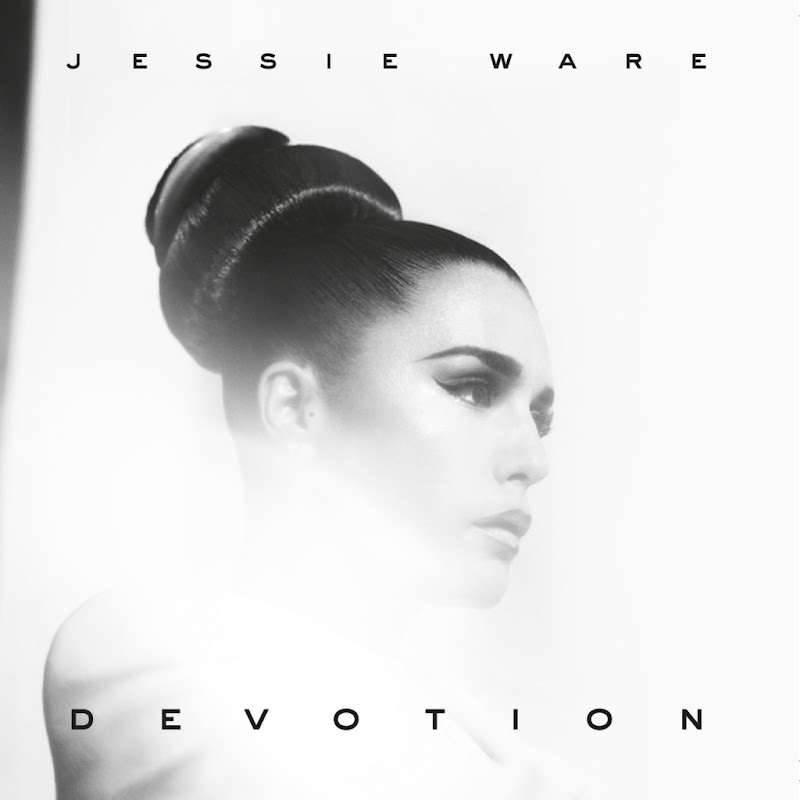 I particularly love her acoustic rendition of this song featured on the deluxe edition of her début album 'Devotion'. Other favourites are 'Running' (the vocals and electric guitar are brilliant!) and 'Night Light'. It's been a while since I did a post on my work. This piece of work is a GIF and I've only experimented with creating these only on a few occasions. Though they look rather simple there is quite a lot of work involved! I made 'The Kiss 0.2' for a short project at uni (BA Photography at Southampton Solent University) to do with time. I was thinking of a few ideas and thought I'd revisit a shoot I did this Jan. 'Kiss Me Kay' (Jan 2011) are stills from a video I made. I was experimenting with time lapse and the subtle differences in each frame in a kiss, a simple act with so many expressions. For my current time project I wanted to have a slightly different twist but fundamentally have the same basis for the idea. This time I shot outside against a fountain background which was also on a time loop for when the water would shoot out. I also used a tripod so all the shots can be level. Thinking about when to shoot and wait for the fountain all involved calculating correct timing and using a very fast shutter. I shot on continuous shoot mode and as it was outside I could shoot at a fast shutter at a low ISO so more detail. To create the image I first resized all the images to 600 pixel width and saved the images again using Fastzone Photo Resizer software I downloaded for free from the internet. This meant I had low risk of Photoshop CS2 crashing due to uploading a lot large images. I then edited the first photo and saved the actions I did to it to apply the action to other photos easily. I added contrast, a few colour filters, soft Gaussian blur and used the sharpen image filter. I opened all the photos I wanted to use one by one and replayed my 'The Kiss' action 26 times. Now all my images were ready to use. I then created a Photoshop document to create my gif. This involved opening all the edited images and simple placing the images on top of each other. I opened the 'animation' window, the tool to use to create gifs. I then selected all the layers and chose the option 'Make frames from layers' from the small arrow on the right of the 'animation' window. I then selected all the frames and chose 0.2 second delay from each frame to the next. To save as a gif I selected 'Save for Web' and chose GIF format, not JPEG. Here's the image I created: Tell me what you think? Being relatively new at creating GIFs I'm quite happy how it turned out. I've been a fan of Michael Fassbender since seeing him in 'The Devil's Whore' which was shown on Channel 4 in the UK in 2008. Since then he's been a rising star and I think it's safe to say he is hot property at the moment! He is currently a well sought out actor in Hollywood with the box office hits such as X-Men: First Class which was amazing, a beautiful retelling of Jane Eyre and 3 highly anticipated films coming out next year: Haywire, A Dangerous Method and Shame. 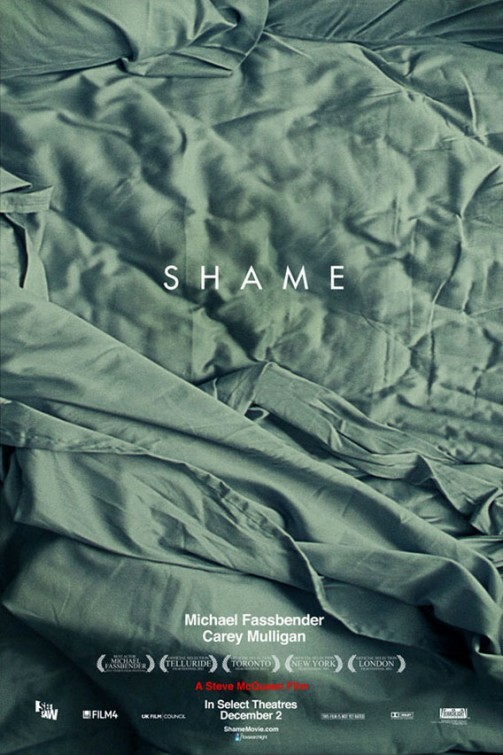 The trailer for Shame really caught my eye which was directed by Steve McQueen. McQueen had directed the hard-hitting drama, Hunger featuring Fassbender 3 years ago which brought Fassbender into the limelight. The pair have teamed up again and Shame looks like an intriguing, mesmerizing drama. Fassbender plays Brandon who has a sexual addiction in New York but when his sister comes to stay everything is turned upside down. Though my very short synopsis of the film seems very shallow the trailer speaks for itself. From just looking at this short trailer it shows that McQueen is certainly a director to watch. My favourite part in the trailer is at 1.00 / 1.34 when Brandon (Fassbender) softly touches a woman's hand on a vertical rail on the NY subway. The mere touch has a sexual energy which I find fascinating. The film is due to be released 13th Jan 2012 in the UK, rated 18. It also features Oscar nominated Carey Mulligan from An Education, another star in her own right. I also love the poster promoting the film. How the meaning of a word can change with the presence of a picture. Text placement and images are powerful tools in advertising. I particularly like how they've used an image of crinkled bed sheets with the simple noun, 'Shame' written in plain sans serif white font. I'm thinking it could be Helvetica however I think the subtext is, not the main title. If anyone knows please drop a comment below! Thanks! My friend Kirsty had just bought the latest issue of Vogue with Gisele on the cover which came with a 'best places to party' guide. 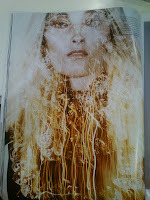 On the back of that cover I came across such a captivating image that I was searching the net for the shoot as I only had a glimpse of the image before we left for our train. I took a snapshot on my phone to remind myself to look it up! I think this image is pretty spectacular. 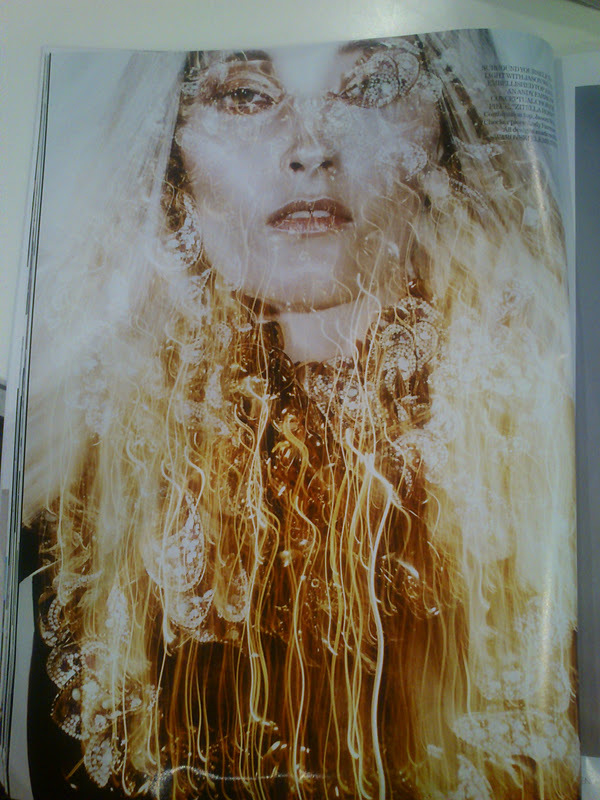 This was shot for Vogue Promotions, Vogue UK Dec 2011 by Benjamin Lennox. 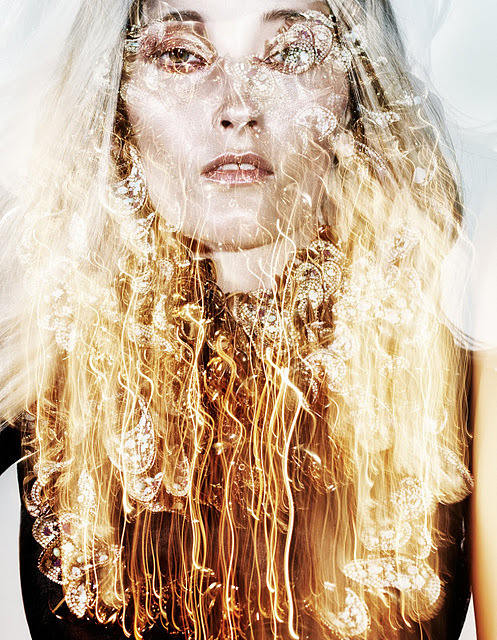 I had found these images on Kim Howells blog who was the stylist for this shoot. I think this shoot is beautiful especially the vibrant colours and the model's expression in my Photograph of the Day. I love the styling, fashion and how it's shot. There really isn't anything I can critique on! You certainly see the sparkle in Swarovski. Combination top, Jason Wu. Chocker piece Andy Farrow. All designs made with SWAROVSKI ELEMENTS. Dress, Roksanda Ilincic. Hat, Jane Taylor. Earrings, Anton Heunis made with SWAROVSKI ELEMENTS. Dress, Monique Lhuillier. Hat, Jane Taylor. Jacket and skirt, both Marios Schwab. Hat, Catherine Piederriere, for Crystal Obsession. Necklace, Jacques Fath. Dress, Marios Schwab. Headpiece made using Chunky Chain necklace, Dannijo; Aquitaine necklace,Simon Harrison; chain, Martine Wester; all made with SWAROVSKI ELEMENTS. Earrings made withSWAROVSKI ELEMENTS. Dress, Kanzi, made with SWAROVSKI ELEMENTS. 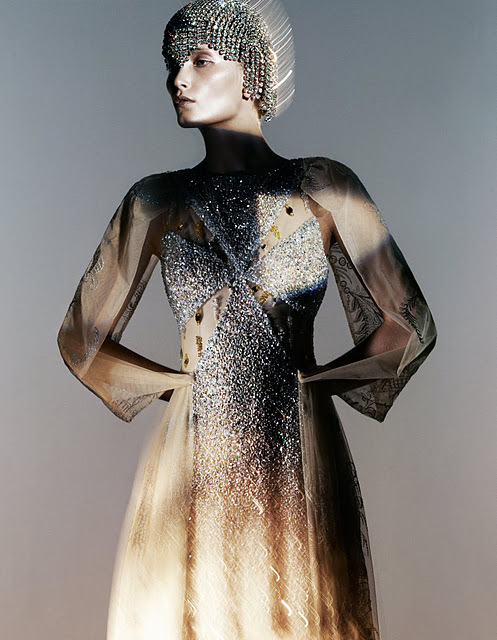 Dress, Rodarte, made with SWAROVSKI ELEMENTS. 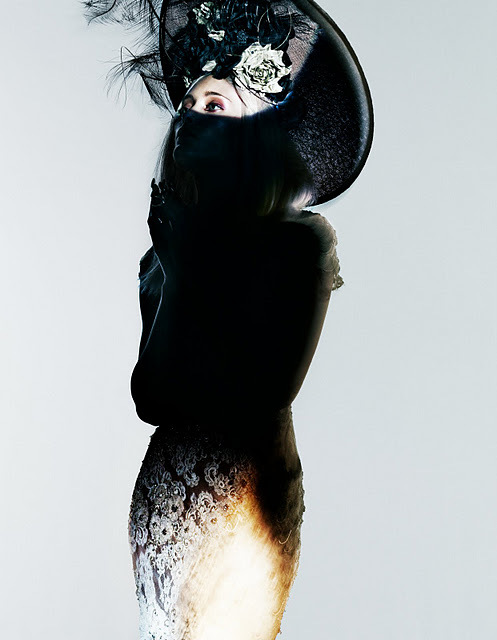 Headpiece, by Helmut Newton, Swarovski Corporate Archive. Dress, Mary Katrantzou. Headpiece, Otazu. Cuffs, Holly Fulton. Panther bracelet and Caddis Cascade bracelet, both Simon Harrison. One-stone ring, Janis Savitt. Matching button rings, SWAROVSKI CRYSTALLIZED. All designs made with SWAROVSKI ELEMENTS. Dress, Holly Fulton, made with SWAROVSKI ELEMENTS. Headpiece, Jane Taylor. Crystal fringe, stylist's own, made with SWAROVSKI ELEMENTS. Jacket, Jason Wu. Bra, ID Sarrieri, made with SWAROVSKI ELEMENTS. Earrings and necklace, both Anton Heunis. Three-stone ring, Miquella. 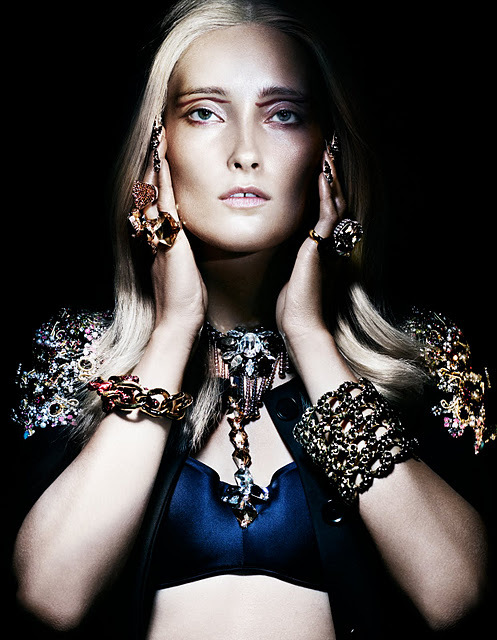 Gold bracelet, Rodrigo Otazu, available at SWAROVSKI CRYSTALLIZED. Red crystal bracelet, Simon Harrison. Matching large and small circle stone rings, both SWAROVSKI CRYSTALLIZED. Small crystal matching rings, Chelsea Taylor. Multi-stonering, The Earring Boutique. Dress, Jenny Packham. Earrings, The Earring Boutique. All embellished with SWAROVSKI ELEMENTS. Skirt and top, Jason Wu. Body piece, Jose Miro. All made with SWAROVSKI ELEMENTS. Why is Ian Somerhalder so hot? Nisha Haq 2010-11. Simple theme. Powered by Blogger.